So that was then and this was now. Well, what do you want for your birthday? I asked. We had already made plans to go back across the pond to visit his son in London, my daughter in Germany and his clan castle in Scotland on his birthday proper. I thought it was a fabulous idea. You see, I go somewhat weak in the knees around a kilted gentleman and knowing what this particular gentleman would be wearing (or NOT wearing) under his kilt formulated some delicious pictures in my rather lusty imagination. Ive read enough bodice-ripping, highland romance novels to have a clear vision of several intriguing scenarios. I was to wear a formal gown to match his plaid. My busy mind reflected back to the ring incident and I was tempted to speculate about the romantic possibilities of kilt and clan castle. But when he invited his son to accompany us to the castle, my proposal hopes were dashed once again. I booked us into a charming B&B on the Scottish Borders. Bessiestown Farm Country Guesthouse, located in Catlowdy is just a few miles south of the town of Langholm. Situated on the English side of the line, it is run by the Sissons, a delightful couple, he Scottish (verra Scottish, ye ken) and she, the consummate Brit. As we traveled back and forth across the border we noted that there was a sign saying Welcome to Scotland as we crossed into Scotland, but there was no corresponding Welcome to England sign on the way back. We learned from Jack, our host, that what with the ancient border conflicts and the proximity to The Debatable Lands, (land lying between England and Scotland, formerly in question as to which it belonged), apparently whenever the English would put up a new welcome sign, it would mysteriously end up in the river! 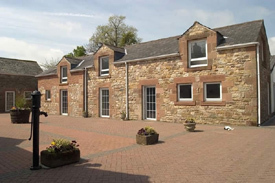 Designed around a lovely brick courtyard, the B&B was surrounded by sheep pastures, like most places in Scotland. We awoke each morning to the gentle bleating of the lambs calling to their dams and the throaty maternal responses. A couple of horses and a shaggy pony grazed in the pastoral setting. 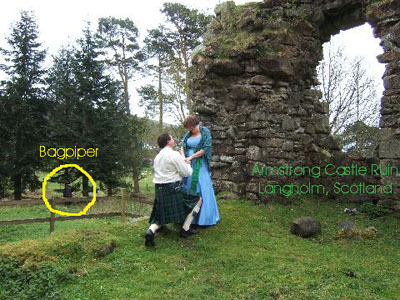 Langholm is home to the Armstrong Museum and the location of the clan castle ruins. It is a small town with a few homes and shops. The twisty river Esk runs nearby. Every summer Langholm hosts a large Armstrong Clan Gathering. On the morning of Ds birthday, we woke up to a typical Scottish day; swirling mist and light rain. Decked out as we were in our Scottish regalia, we were the stars at breakfast. After our Scottish morning feast of eggs, scones, good strong English tea, bacon, sausage AND haggis (delicious!) 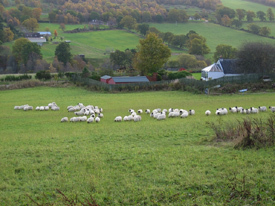 D, his son Z and I piled into the small hired car and drove off past the sheep fields and small farms toward town. The rich green smells of the countryside wafted in the windows as we sped along dislodging the occasional startled pheasant from the hedgerow. We pulled into the parking lot of the Armstrong Clan Museum and Z. took some pictures of us in our finery. It started to heave down with rain so we piled back into the car to wait it out. It wasnt long before D. opened my door exclaiming, Its stopped raining and listen! I can hear a bagpiper! Sure enough, a lone bagpiper was playing at the far end of the street, strolling slowly along in time to his tune. Grateful for the reprieve in the weather, we made our way across the muddy pasture, easily skirting the occasional puddle. The slick green grass smelled pungent and earthy under our feet. A flock of curious sheep surrounded us, ears pricked, snorting and baaing softly. They followed behind us as we continued on our way. The remains of the castle were surrounded by a low fence, erected to protect it from the livestock. D. helped me (and my voluminous skirts) to climb over it. Z. went around exploring the far side of the castle grounds. 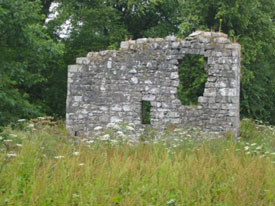 The castle ruin is situated on a small rise. Hands clasped, we came to stand in the shadow of the crumbled castle wall. Behind us was a large opening where perhaps there had once been a window looking out toward the town. The gray hand-hewn stones were painted with various lichens and mosses. Fragrant herbs, delicate ferns and other small botanicals sprouted from the cracks in the wall. The bagpiper had followed us into the field and stood as if he were playing a concert just for us. Several times I had to blink back tears at the beauty of the soulful sounds and the fairytale scenery. It was as if the spirits of all of the Armstrong ancestors had joined us there in that moment. I could see that D. was equally emotional. There is just one more thing Id like for my birthday, he said softly in my ear. Oh, whats that, then? I responded, unable to imagine how such a perfect moment could be made any better. OH-MY-GOD! I think I said. Is that a yes? he smiled, reaching into his sporran producing a tiny box. My head was spinning. He opened the box and presented me with a stunning diamond engagement ring. It was a perfect fit. He held my face in his hands and we kissed. Z. materialized from the mist and from his satchel brought forth a bottle of very expensive single malt scotch and 4 wee glasses. The hired bagpiper joined us in a toast. As we held our glasses high, the sun burst from behind a cloud and shone a narrow golden ray down upon us. I felt the sweet and smoky golden nectar slide down my throat, kindling a warm glow in the pit of my stomach. We smiled at each other in the magical light of the Scottish sun and began the next chapter of our deliciously romantic life together, D and I.